Some people never leave the house in the morning without coffee. Others can’t walk out the door without first catching the news. And some claim their cell phone as their one necessity item. But for me, it’s breakfast. I cannot leave my house without first figuring out what’s to eat. I’m a huge fan of breakfast and treat it as a special part of my everyday routine. Weekdays are a bit rushed leaving me little time for elaborate items like pancakes or quiche. But weekends? That’s another story. I find few things more alluring than waking up at a leisurely hour, moseying to the kitchen and making a delicious breakfast to be eaten over coffee in bed. Although pancakes are my all-time favorite morning item, I’m always up for trying new recipes. 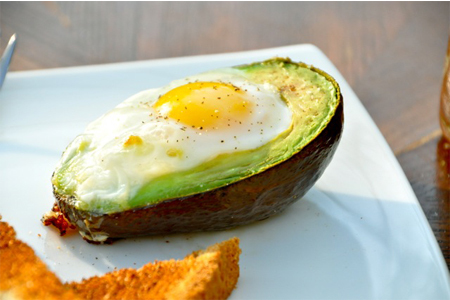 So when I saw this idea to crack an egg into an avocado and bake it, I knew I had to try it. 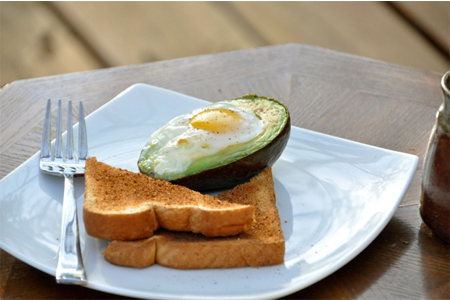 Besides it being incredibly good for you – with healthy fats, nutrients and loads of protein – the process is also quite easy, and would be the perfect ‘egg in a basket’ treat to serve your family this Easter for a laid-back breakfast or brunch. To prepare the dish, simply preheat your oven to 425 degrees and place a cast-iron or oven-safe skillet on the middle rack. 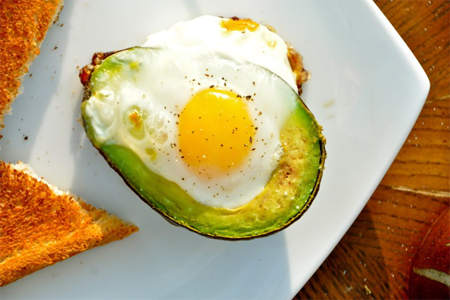 Then, cut a medium-to-large ripe avocado in half, remove the pit, and using a spoon, scoop out a little bit more of the avocado to make more room for the egg. If your base is wobbly, you may want to slice a little of the skin off to stabilize it. 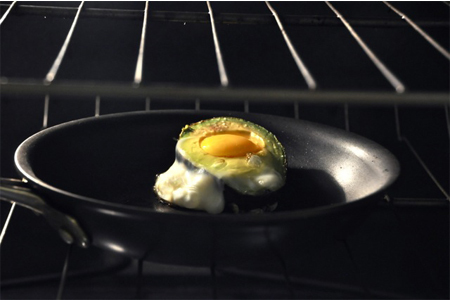 Next, carefully remove the heated pan from the oven and crack a small egg into the hole of the avocado, reserving a small amount of the white if it looks like it will overflow. Then season as desired, place the skillet back in the oven, and cook until the egg white is completely cooked. Depending on how done you prefer your yolk, this should take about 10-15 minutes. Tip: Covering the skillet with an oven-safe lid would speed the process if you’re low on time. Once the egg is done, serve it alongside fruit salad, toast or a whole wheat tortilla with salsa for some south-of-the-border flair. I opted to scoop mine out, smear it on my toast and top it with a little more salt and pepper. I found just one half to be incredibly filling and satisfying. I love this idea and would highly recommend it to other adventurous eaters like myself. Kids would no doubt love the playfulness of this dish. And considering how healthy it is, it would be a great choice to balance out all the chocolate bunnies and malt balls to be found in their candy baskets this Easter. Dana runs, she bakes, and she writes, making her perfect for us! She holds a bachelor's degree in journalism from Wichita State University, has a self-taught proficiency for vegan and vegetarian baking, and considers herself a lifelong learner of all things health. She lives life to the fullest in Wichita, KS with her husband.